You may have noticed all the different types of squash at your local grocery store lately, and while pumpkins and butternut squash seem to get all the love, this week we're solely focusing on those little green ones. Acorn squash, also called the pepper squash, is often acorn-shaped and dark green, almost black. About 100 grams of acorn squash has 40 calories, 18 per cent of your daily vitamin C intake and 10 per cent of your daily vitamin B-6. Filled with a sweet orange flesh, this winter squash can be fried, baked, roasted or blended into a soup. 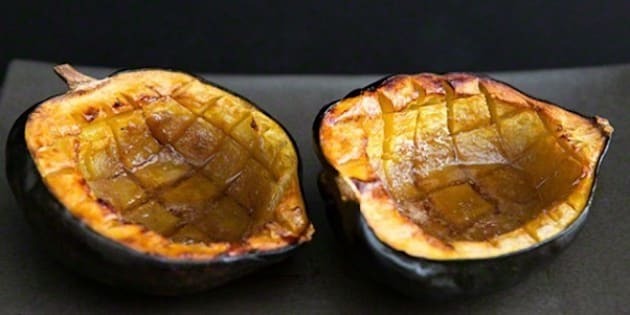 According to Everyday Health, an acorn squash's skin is just as healthy as its insides. The skin is full of fibre and antioxidants, and can be roasted or even microwaved (just make sure you clean it). In case you missed it, last week we packed butternut squash.